on February 23, 2017, 11:22 a.m.
It’s official. Awards season is upon us again and this week’s Oscars will define the big Hollywood winners from the past year. But rather than focus on the past, YouGov, one of the world’s leading research firms, asked people across Asia Pacific which cinematic release they are most excited about this year. Out of 13 upcoming releases polled, “Fast & Furious 8” is the most eagerly anticipated, chosen by 18% of respondents as the new release they are most looking forward to this year. “Transformers: The Last Knight” and “Pirates of the Caribbean: Dead Men Tell No Tales” also score highly, with 13% and 10% of those polled most looking forward to these films. Younger cinemagoers are more excited for the release of “Beauty and the Beast” than the older generations; 14% of those 16-24 year olds are most looking forward to its release, which is more than three times of those over 55s (4%). Surprisingly, some of the most high-budget films score lowest; “Kong: Skull Island”, “Lego Batman” and “Logan” all attract just 2% of first-choice preferences from respondents. Despite low levels of excitement for some of biggest action film set for release this year, action films are popular across Asia Pacific, with 55% of respondents citing it as one of their top three favourite genres. Unsurprisingly, action is more popular among men than women, with 67% of men and 43% of women listing it as one of their top three types of film. True to stereotypes, sci-fi is also much more popular with men that women, favoured by 32% of men and 19% of women. Conversely, romance films are three times more popular with women than men; 30% of women cite romance as one of their favourite genres compared to just 10% of men. However, tastes converge around comedy (enjoyed by 45% of men and 52% of women) and animation (favoured by 22% of men and 30% of women). Watching films in a foreign language is least popular in Australia, where 35% of consumers don’t watch films in a language other than their own; more than four times the regional average of 8%. Regionally, of those that watch films in a foreign language, three quarters (74%) prefer subtitles over dubbing (18%). However, dubbing is most popular in Vietnam, where 43% prefer so. The most important factor for consumers when deciding whether to see a film at the cinema is the storyline (seen as an important consideration by 52% of respondents). Other driving factors include the cast (important to 48% of those polled), the genre of film (48%) and the trailers that consumers have seen (45%). Publicity around a film matters most in China, where 40% of those polled say it is a factor in whether they decide to see a film at the cinema, whereas Filipinos are the nationality most swayed by the use of special effects (30%). Awards nominations, including Oscars, appear to hold little sway with consumers; just 12% say that such nominations influence their decision to see a film. Much of the hype that surrounds new releases comes from social media, with 65% of consumers finding out about future films this way. 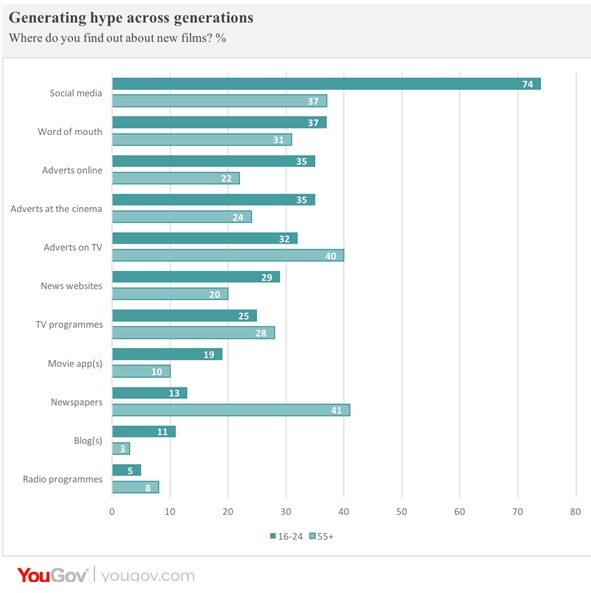 However, there is a significant generational gulf between how different ages find out about films; whereas three-quarters of 16-24 year olds (74%) find out about new films via social media just 37% of over 55s do. By contrast, 41% of over 55s find out about new releases from newspapers compared to just 13% of 16-24 year olds. Besides social media, across generations, TV adverts, word of mouth and cinema adverts are key sites for finding out about new releases, used by 35%, 34% and 33% of consumers respectively. Going to the cinema is about more than just the film and adverts are seen by many as integral to the cinematic experience. Over half of APAC residents (57%) think that commercial adverts shown before films help to set the mood. This rises to nearly three-quarters in the Philippines (72%), 63% in Thailand and 61% in Malaysia. 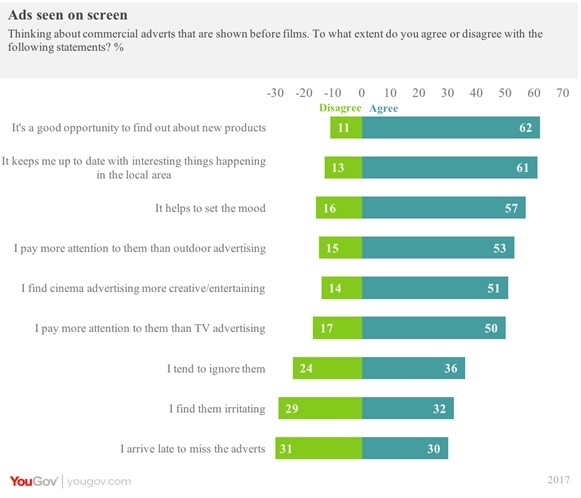 Nearly two-thirds of respondents (62%) also agree that cinema advertising is a good way to find out about new products and 61% agree that it keeps them up to date with things happening in the local area. Half of consumers (51%) find cinema advertising more creative and/or entertaining than other forms of advertising and roughly the same amount (50%) also admit to paying more attention to cinema adverts than to TV adverts. However, not all consumers embrace the commercials. Over a third of those polled (37%) admit to ignoring them, particularly in China where this rises to nearly half of respondents (46%). A significant proportion (30%) also confess to arriving late to miss the adverts, particularly in Thailand, where (38%) have done so.